Tonight, we invite you to the French Riviera, one of the most exciting places on earth – without ever boarding a plane! And celebrate Mardi Gras and the Carnival of Nice on French soil as we welcome you to a special evening at the Embassy of France! From the elegance of classical French culture to the most celebrated Rivera nightlife of the 21st Century, experience a special evening of fantastic French food (buffet-style) and wines, late night DJ and a nightclub experience that will turn the venue into “The Embassy of Lights”, with a spectacular Riviera-style ambiance, as well as attractions and shows. - Enjoy the flavors of Nice, Monaco and St. Tropez in the beautiful and festive Maison Francaise at the French embassy. - Be a part of the Carnival of Nice, one of the world's largest carnival. Mardi Gras Style beads will be offered to all guests upon arrival. Be on the lookout for some special Cirque Style Carnival Characters! - Dance the night away. From the glorious parties in Cannes to the Embassy of Lights, a French DJ will spin the best American, French, Euro and Top 40 dance hits. The grand ballroom of French Embassy will be turned into a dazzling Riviera-style nightclub. A spectacular light display will fill the embassy and the dance floor to add that special late night European touch! - Carnival Fashion Competition (Optional): dress in your original chic and creative carnival outfits! At 11pm, one male and one female winner will be selected as the Carnival King and Queen by virtue of their outfits and receive special prizes. 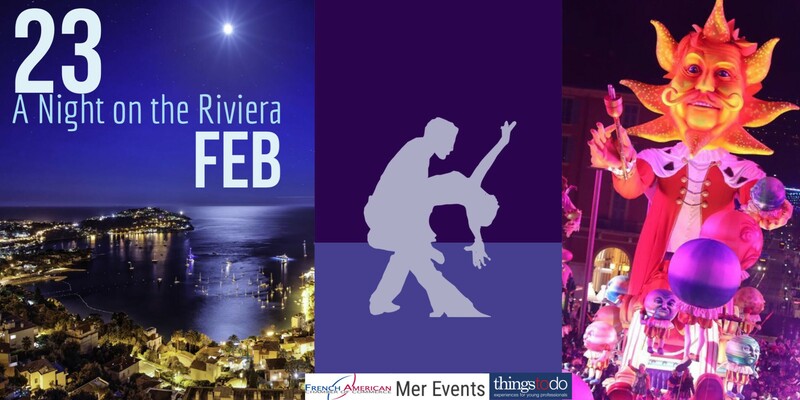 - Cannes Film Festival: while dancing and celebrating, enjoy films and videos on the walls of the embassy showcasing the Rivera! - Monte Carlo Casino mock up: In the Spirit of Monaco, spin the wheel and try your lock at roulette. (Mock gambling). - Mediterranean Fish Stew will be the featured dish of the evening, thanks to our sponsor and long-time member Cuisine Solutions. - Crêpes bar: Delicious French crêpes prepared by Chef Hughes Cossard! Tasty and fun! - Open bar all night with French wines, pastis, beers, real Champagne (Cannes VIP tickets) and sparkling wines. Everything will be from France! - VIP Reception (Cannes tickets): From 6:30p to 8p, a VIP reception will allow you to enjoy delicious hors-d'oeuvres and special wines, including Champagne from Champagne. - Tables: Please note that the event is standing. However, a limited number of tables can be reserved, with table service available. - Cannes VIP Reception: walk the red carpet at 6:30pm, and stay until the end of the event. During this hour and a half, you will enjoy delicious hors-d'oeuvres and special wines, including Champagne from Champagne, while a music ensemble delights your ears with classic French songs. - Monte Carlo Table Service (table for 4): From 6:30pm to 12:00am (includes VIP Reception). Includes a reserved table, table service and unlimited Champagne. Very limited number of tables. Please reserve early. - St. Tropez Tickets (8pm to midnight): Includes free food buffet and a complimentary welcome glass of pastis, the South of France's favorite drink. Open Bar All Night! - FACC members get 20% off. Please register with code FACCMEMBER. Please note that membership will be verified prior to the event. To become a member, email or call us at 202-640-1806. Membership info here. - For security reasons, there will be no parking inside the Embassy. Public parking is available on Reservoir Rd. However, we strongly advise you to use a car-sharing service. - This is an adult-only event. No one under 21 allowed. - Part of this event's proceeds will go to charities.